NEWPORT NEWS, Va., Oct. 12, 2010 -- Northrop Grumman Corporation (NYSE:NOC) completed a significant work performance milestone on the Nimitz -class aircraft carrier USS Theodore Roosevelt (CVN 71) with the installation of the 010 level of the ship's island on Oct. 8. The carrier is undergoing a refueling and complex overhaul (RCOH) at the company's Shipbuilding sector, the nation's sole designer, builder and refueler of nuclear-powered aircraft carriers. 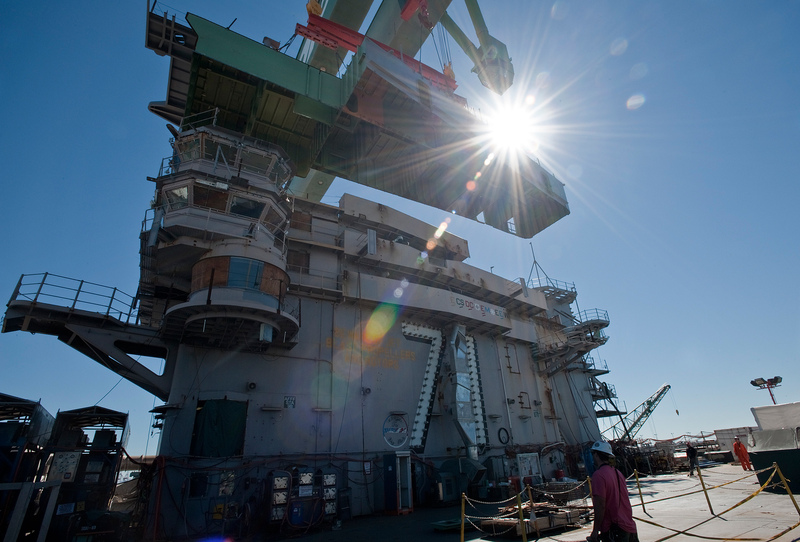 "Our combat systems team is a group of experienced shipbuilders that took on a sense of ownership and commitment while executing this key event," said Krueger Jackson, combat systems construction superintendent at Northrop Grumman Shipbuilding-Newport News. "Achieving success now positions us for continued success during the remainder of Roosevelt 's RCOH." The 66-ton 010 level structure houses radar, communication and other electronic equipment. During the ship's RCOH, most of the original structure and components from the 09 level and above are completely removed, reconfigured or strengthened to accommodate the ship's new mast. "The 010 lift and placement represents a tangible inflection point – we are re-building this warship to take its place on the line. It's important for the sailors to see the island take shape," said Capt. William J. Hart, Commanding Officer of USS Theodore Roosevelt. "The sailors will begin re-wiring, rebuilding and shaping the ship for the next 25 years. First pass quality will be a common theme and one the crew will come to embrace." The removal and reconfiguration of the island structure and main mast began shortly after the ship arrived on Aug. 29, 2009. Launched in 1984 and delivered to the Navy in 1986, USS Theodore Roosevelt (CVN 71) is the fourth Nimitz -class carrier built at Newport News and is the fourth ship of the class to undergo the major life-cycle milestone of RCOH. The project is scheduled to last more than three years and will be the ship's one and only RCOH in a 50-year life span.